It all started when our son, Paul, was born in 2001. A friend told us about the Down Syndrome Association of Central Ohio (DSACO) and before we barely had Paul settled in at home, we already had a welcome basket. They were comforting and reassuring, and we knew right away it was a very special organization. We’ve been involved with DSACO ever since. Paul is not your typical child with Down syndrome. While he had the very common hole in his heart, which required open heart surgery as well as the usual characteristics of Down syndrome, Paul also has ADHD and OCD. Paul never stops moving, dancing, and jumping. We’ve actually come to enjoy his energy. He loves hiking, so every Saturday and Sunday, Paul and I make our usual trek to one of the many parks close by. Additionally, Paul loves baseball, basketball, and jumping on the trampoline in the backyard, as well as playing inside with his Hot Wheels and Legos. Paul was one year old when we attended the 1st Annual Columbus Buddy Walk® in 2002 at the Franklin Park Conservatory. We had a wonderful experience and it instantly became an annual event for our immediate family as well as our extended families, who come in from out of town every year. For the first several years, we didn’t have an official team. 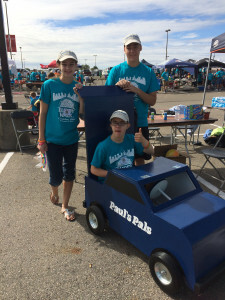 Then Paul’s brother, Billy, and his sister, Grace, started asking to have an official team for Paul. So, with the pressure mounting, we came up with the name: Paul’s Pals. Every year, our extended families as well as our neighbors are our biggest supporters. I also reach out to coworkers at my office and teammates on my bowling and softball teams. Our biggest recruitment tool is email. The initial email is sent out on World Down Syndrome Day, March 21, which is about 6 months prior to the walk. Subsequent emails are sent out at the 3 month, 1 month, 2 week, 1 week, and 3 day intervals. It’s simple, it’s not overwhelming or intrusive, and it gets the job done. Most of the fundraising comes from those supporters we reach out to via email. However, one year we did hold a Euchre party in my hometown of Canton, Ohio, where my sister lives. She is probably the biggest supporter of Paul and our Columbus Buddy Walk® team. She always wanted to do something extra. While the party was a challenge to organize, setup, and obtain a venue, it was truly worth the effort. We were able to raise over $1000 for DSACO. My favorite part of the walk is seeing the sea of colored shirts and the huge line of supporters making their way around the stadium. There is so much love and kindness at the walk, it just makes your heart melt. I also look forward to seeing our families come in every year for the walk. My sister and her family come and they make a weekend out of it, with a visit to the Columbus Zoo as one of their traditions. My wife’s parents and her cousin’s family come from Chicago for the walk every year. Several members of our extended families also make it out, so the walk has turned almost into a family reunion of sorts. We all have such busy lives, but the walk seems to slow things down for a few hours and allows us to really enjoy each other’s company. For the longest time, Paul’s favorite part of the walk was the cheerleaders. As we’d come around the corner, they would ask for Paul’s name. Before you could blink, they were all cheering in unison for Paul… “Paul, Paul, Paul”. It’s amazing how something so simple can mean so much. Paul also enjoyed the piggyback rides I would give him every year at the walk to help him cope with the large crowds. When Paul entered his teen years, it simply became too much for me to carry him around the entire Mapfre stadium (where the walk is now held). Enter Mr. Jim Hrivnak. Jim, the former mayor of Powell and dear family friend, along with Paul’s brother, Billy, constructed a special car for Paul to ride in for the walk. The finished product was amazing. The concept is basically a shopping cart where Paul rides, and someone pushes from behind. The car allows Paul to sit and relax, minimizing the effects of the noise and the crowd. Paul loves it. Our family loves being a part of the Columbus Buddy Walk® each year. My advice to other team captains is this: there is no wrong way to “do the walk”. There is no wrong way to fundraise, and there is no wrong way to enjoy the walk. The old saying about your job, “love what you do, do what you love”, certainly holds true for the walk. Enjoy the precious time you have with your family, especially your Buddy.